Discussion in 'High Definition' started by Katatonia, Apr 6, 2010. I knew there was a good reason that I kept putting off getting the single Blu-ray release of The Good, the Bad and the Ugly. I guess Duck, You Sucker (A Fistful of Dynamite) will be coming seperately at some point in the future...hopefully. I really liked the fortitude of that other set they released, it was packaged very nice. This looks to be a more basic affair, but nice to have everything consolidated into one little case. It says there are three discs in there, so that's good. I don't think I've ever seen three discs in a single standard Blu-ray case before, that might be a tight fit! With this and Django coming, it looks to be a good year for the spaghetti western on Blu. I can't say I'm missing Duck You Sucker any. In fact, I'm glad it's not part of the set. 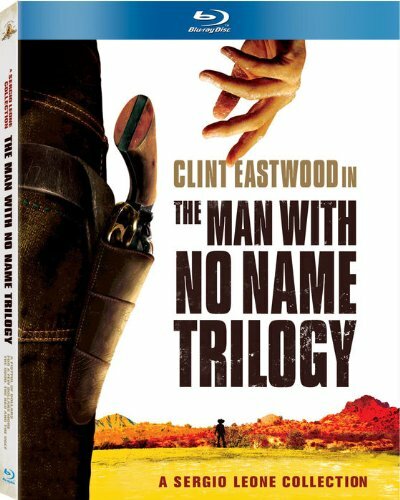 My only complaint; I wish they titled it "The Dollars Trilogy", but that's a minor point. Also, I know many people weren't too happy with the transfer for The Good the Bad and the Ugly (including me). I hope they do a better job with the other two. Namely, no dnr! I don't think I've ever seen three discs in a single standard Blu-ray case before, that might be a tight fit! Warner does it fine. The Harry Potter and the Half-Blood Prince Blu-ray had 3 discs in an HD Slim case (Blu-ray+DVD+Digital Copy). That's only the pre-release artwork though, so the case could turn out to be thicker or perhaps even a Slip Case. I'll be getting this for sure, but Duck, You Sucker needs to be coming sooner rather than later. My favorite western ever, that one. same with The Dark Knight blu ray. The Good, The Bad, & The Ugly was one of the first Blu-ray releases I bought. Wish I had waited. I'm really disappointed that they are not releasing the whole Sergio Leone set like they did on DVD. Duck, You Sucker gets neglected yet again. Another thing I'm concerned with is that the specs for the version of The Good, the Bad, and the Ugly in this set lists the running time as that of the theatrical release and not the restored longer international release that the single blu-ray contains. Hopefully that is just a typo, but I'm afraid MGM is trying to trick us so they can put out a better box set in a few years. The box set seems to be botched. DvdBeaver reports that the transfer for Fistful of dollars is either cropped or zoomed in.I hope MGM didnt puposely screw with the transfer just to release another box set in the future.I just bought the Anthology recently so I may wait and see if MGM recall the disc or rectify the problem.The blu of TGTBTU is still the release that was released before.Its a shame because the stills for For a few... look awesome.Well enough of me, here is the link. I heard about this, but I also have the Italian Blu-ray arriving to me any day... and cheaply from a friend in Rome. Technically, MGM didn't botch it and it wouldn't be the first time they've zoomed in a transfer for whatever reason. They simply didn't have access to the Italian restoration and the original negatives. The truth is that unless someone reads the reviews and sees the screenshot comparisons, they'll not even be aware of it. Many studios do it unfortunately. Just look at Sony's Blu-ray of Labyrinth. The transfer is zoomed in when you compare it to the old DVD transfer. Also, the Friday the 13th Blu-ray from Paramount was an odd case that can still be debated. The UK DVD transfer was zoomed in as well, and nobody even really noticed that for years. I own both, and the restored Italian Blu-ray is easily far superior as far as visuals go. I just wish it had lossless English audio...but the original English mono track does sound better than the one on the MGM Blu-ray. Is the Italian Region locked? Probably global ebay sellers, or search on Amazon for "Per un pugno di dollari" and you'll find some Italian sellers who sell it.